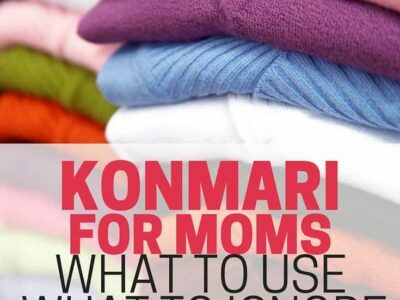 Have you heard of the Konmari method? In the past few years, Marie Kondo’s book, The Life Changing Magic of Tidying Up, has taken the world by storm. Thousands of people who want to declutter their homes have used this book as a guide to help them get back on track, but many parents have criticized it for being unrealistic for families with young children. While there are certain parts of the book that have great advice for anyone, it’s true that there are some things that are a little bit unrealistic for moms. Marie Kondo’s new TV show, Tidying Up with Marie Kondo, recently released on Netflix. It’s full of great ideas – even for moms. Go here to learn more about the show, and see the best takeaways from each episode. In this post, I will share with you the things from The Life Changing Magic of Tidying Up that have helped me as a mom, and I’ll tell you about the things I’ve chosen to ignore. Start with the end in mind. Marie Kondo recommends visualizing your destination before you start. Then after you’ve done your visualizing, ask yourself why you want to do it. It’s always good to start with a good, clear mission in mind. This is great advice for anything, including tidying up your home. Does it make you happy? Marie Kondo also wants you to ask yourself “Does it spark joy?” for the things that have no real reason for being discarded. As you’re decluttering, when you see something that you want to keep but you’re not really sure why you want to keep it, ask yourself the question “Does it spark joy?” Is it something that makes you happy? If not, it’s probably something that you can get rid of. What do you want to KEEP? Instead of focusing on what we need to get rid of, Marie Kondo recommends choosing what we want to keep instead. This is a different way of looking at decluttering because it really helps you to focus on the things that are working for you. Handle each item. As you’re tidying up your home, Kondo also recommends handling each item. Pick it up, look at it, and do a good assessment of whether or not it’s something that you want to keep. Declutter by category, not place. 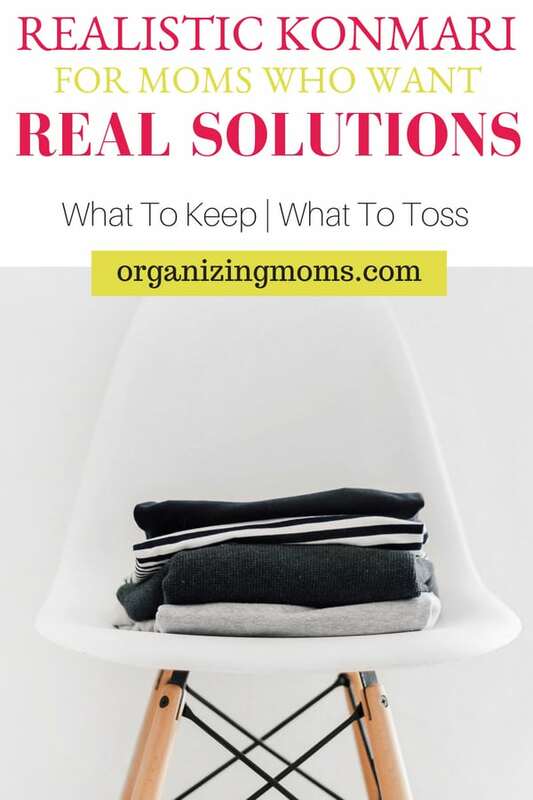 When you want to declutter your clothing, for example, she recommends putting it all in one place at the same time and decluttering from there, instead of going from closet to closet throughout your house. Begin with the easy stuff. Another recommendation is to begin with items that are easier to make decisions about. This will get you into the mode of decluttering, it’ll give you some decluttering wins in the beginning. 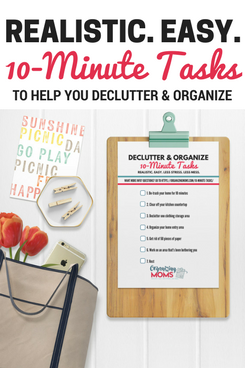 It will build your decluttering momentum, which will make you better able to declutter some of the sentimental things later on. Wondering what the easy stuff is? This book is full of easy decluttering ideas. Declutter everything in a category at the same time. One thing that’s really hard for moms to do is to pull everything out at once. 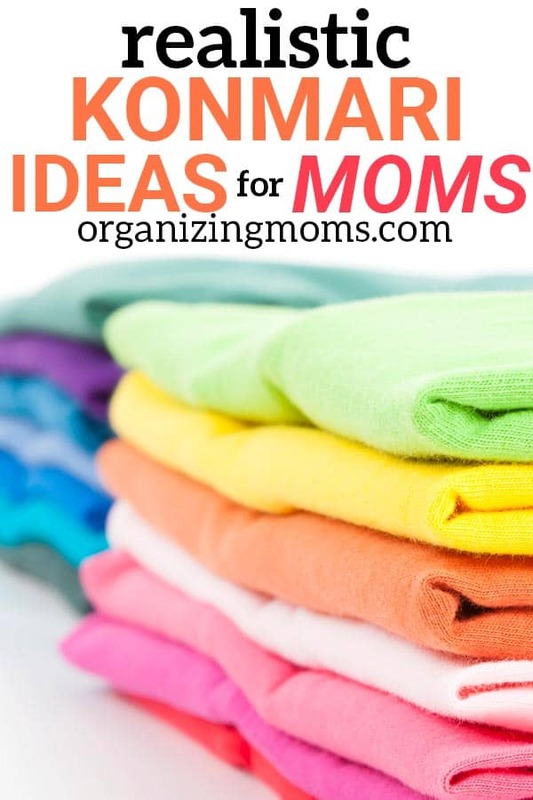 This may be realistic if your children are out of the home, but if you’ve got littles running around, having a bunch of clothes on the floor at the same time is close to impossible. It will be hard to find a big block of time to work on it all at once, and there’s a good chance that pile of clothes will be transformed into a fort by creative kiddos. While it is a good idea to declutter by category, not place, sometimes it just isn’t realistic. Instead of decluttering all of your clothes at the same time, you may want to instead declutter an even smaller category of clothing. It’ll be much easier to pull all your jeans out and work on them at once as opposed to all of your clothes. Talking to your stuff is not required. You do not have to tell your socks, “Thank you for their service.” Marie Kondo advocates thanking the items you’re getting rid of for their service. If this is something that you enjoy doing, you can, but I just found it a little bit goofy. If you want to do it, you could make it a game, especially with your kids, and say, “Adios” to all the things that you are decluttering. Folding socks into squares. This is not really necessary. Kondo also says that socks don’t do as well or have bad energy when they are folded up or twisted up in a weird way. She has a specific method for folding socks. I’ve tried this method and it has not worked for me. It looks really cute in the beginning but it just wasn’t practical. I’m back to folding my socks the way I used to, and they seem to be fine with it. I decided my socks would be happier if I let them be free. Kind of like in a mosh pit. You can read more about my super-easy way to handle socks here. Believing that you will never have to declutter again. 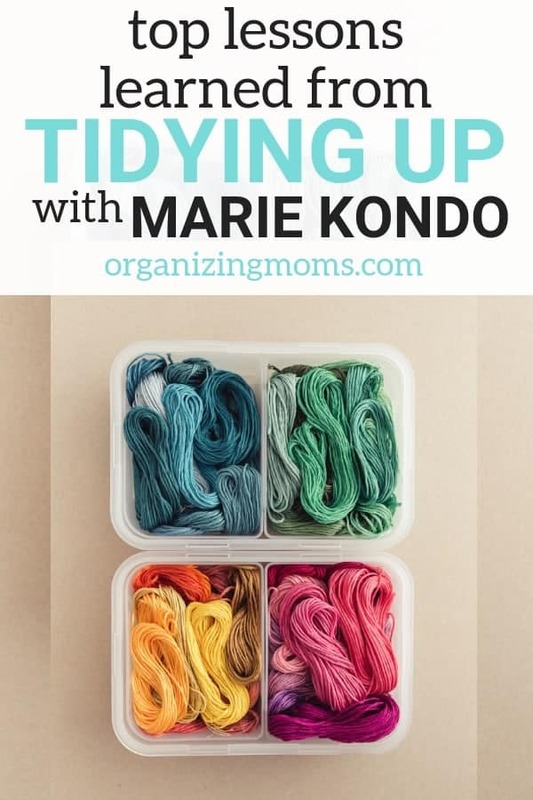 Kondo says that once you declutter using her method, you will never have to declutter again. This is hard to believe. When you have children, things are always coming in and out of your house, and it’s difficult to keep up with it all. Go easy on yourself and realize that you are doing all that you can to keep your home tidy. If things get cluttered from time to time, take a step back, visualize your destination and how you want your home to look, and get to work. While I do think there are a lot of strange things in the book, I think it can be inspirational. Kondo looks at decluttering in a whole different way and it gives people different ideas for how to tidy up their homes and get rid of sentimental items. I recommend the book, but I don’t recommend taking it too seriously. As a mom of young kids, if I tried to follow the exact advice in the book, I’d be setting myself up for failure. However, there is enough good information in the book to make it a worthwhile read. 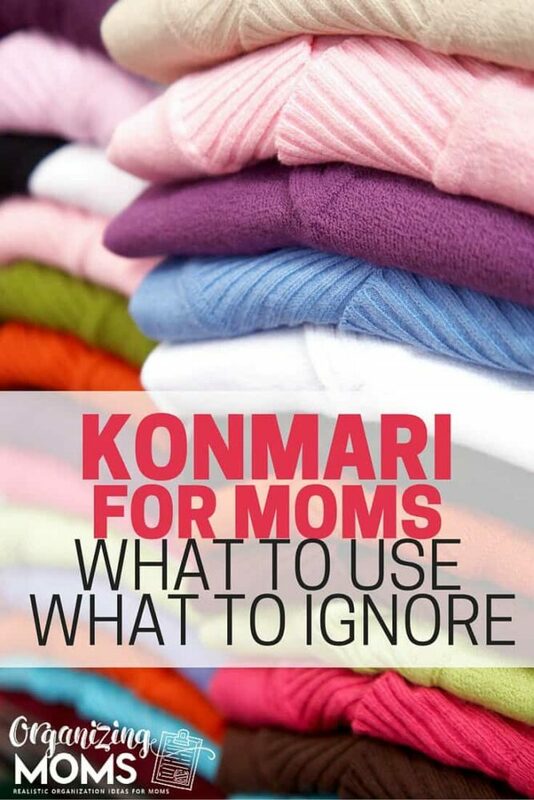 If you’re looking for a decluttering guide that may be more appropriate for moms of small kids, Get Rid of It! A Step-By-Step Decluttering Guide for Beginners, might be a good choice. 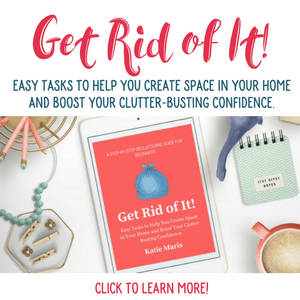 The book includes step-by-step instructions, realistic ideas, and inspiration to help you stay on track as you declutter your home.